» Blog » Happiest Birthday to Sir Nathan, Team Leader of OSOmniMedia’s Web Development & Graphic Design Team! 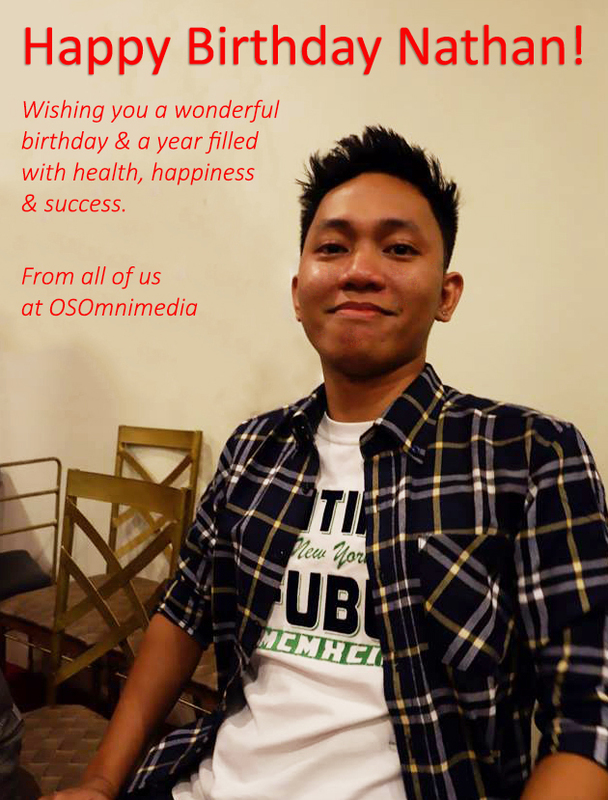 Happiest Birthday to Sir Nathan, Team Leader of OSOmniMedia’s Web Development & Graphic Design Team! The warmest birthday greetings to our Legacy team leader, Nathan! Work days are more lively with you around. Wishing you only the best on your special day! From all of us at Team OSOmniMedia! Be part of our growing group of dynamic and experienced IT & web design experts in Davao! The OSOmnimedia Design Group has been partnering with clients both locally in Davao and overseas for over 10 years now, providing web business solutions such as web development, programming and SEO services for partners in the US, UK and Australia among others. Be one of us! Send your applications to hr@osomnimedia.com or visit our Career Page to find out more about our job openings.